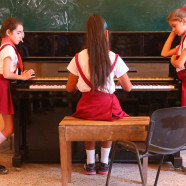 This is a benefit concert to raise money for a project to buy musical instruments and spare parts for the Conservatorio Guillermo Tomás music school in Havana. The donation will be taken to Cuba in April by a solidarity brigade organised by the campaign Rock around the Blockade. This project follows up on a previous fundraising campaign to send a piano to Cuba initiated by Cuban pianist Eralys Fernandez.